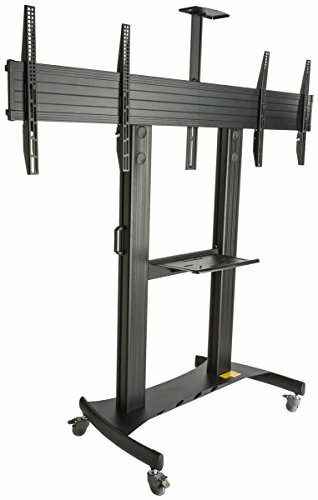 This mobile (rollable) TV stand fits (2) 40" to 60" screens weighing up to 150 lbs. for each bracket. The stand is made from aluminum and steel and has four wheels. The wheels are lockable allowing you to transport and then stabilize your TV. The mount is height adjustable and comes with integrated cable management. The stand is VESA compatible up to 600 x 400.